Snowy Moose Creations: TTS is Back! 'Tis The Season is back and I'm ready to start building up my Christmas card stash for 2016! 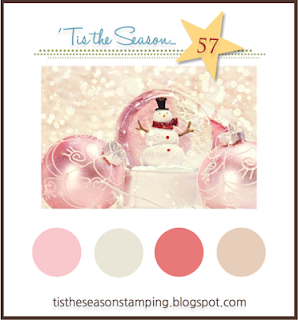 We're starting off the year with a soft and feminine color challenge. It was a big tough for me but I ended up drawing inspiration from the beautiful sunsets we see here in Alaska during the winter, hence the pink/peach sky in the snow globe. 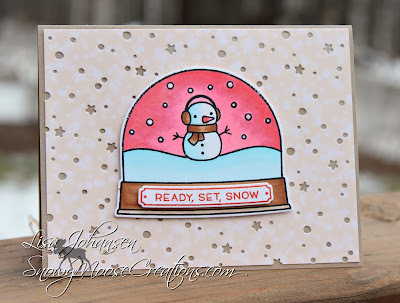 I used Lawn Fawns set Ready, Set, Snow and kept the background pretty simple, only using the Snowy Backdrop die. I wanted the colors of the images to be the standouts and main focus. I hope you'll head over to the 'Tis The Season blog and check out what the rest of the DT came up with, and then play along with us! Super cute card, and always done perfectly. I have this stamp set too ☺ I love snow globes... that's my kind of snow..haha.